At this very moment, Greenwich Pizza is making more and more barkada (friends) and families happy and excited over the new Greenwich Pizza Thins! Nationwide sampling of the new Greenwich Pizza Thins is on! It was initially set yesterday, but because of typhoon Glenda, management decided to move it today. It is a nationwide sampling of Greenwich Pizza Thins! I heard they are aiming to give out 10,000 boxes! 100 per selected store. I actually just came from the Greenwich SM North EDSA store (the Greenwich Pizzeria!) for the #CrackThat Day event. What I initially thought was a simple launch, turned out to be an introduction to more new exciting things from Greenwich. The event was hosted by certified Greenwich kabarkada, and top radio DJ, Sam YG. It was awesome to see him again after our last encounter here. And guess who is the newest Greenwich Kabarkada? It's Elmo Magalona! Elmo is the rapper behind the brand's catchy #CrackThat radio commercial. Click Read More to know more about Greenwich Pizza Thins and CrackDay! Before the event, they asked us to download an app called Almost Real and they advised us to keep it on. This is the first time I heard of this app, but looks like it is used by different brands to provide rewards to consumers. When we downloaded the app, we saw the Greenwich campaign locked up. After Elmo was introduced and they played the Greenwich theme, the Greenwich campaign has unlocked, and we received instant treat! A new limited edition Greenwich speaker! What makes it super awesome, it is a DIY kind of speaker. The housing is made of a small pizza carton that we need to crack open so we can install the speaker. The boxes designs were created by talented young artists who were also in the event. Super awesome! I wonder when can I have my artwork printed in a pizza box? (does anyone have interest on sticks and planes? :)). Thank you Greenwich for this cute kit! Now for the real treat, here's the Greenwich Thin Pizza! It was warm when served - the top part was chewy and the bottom pan did crack when you take a bite! I almost got worried about my braces :D. What a pizza experience! Now, for the last super awesome treat from Greenwich, they gave us all a Greencard! Wohoo! Not the one that can send me to US (I can wish!) But Ultimate Greencard! Greenwich understands pizza party and DVD marathons at home best enjoyed with pizza - so Greenwich is offering a unique delivery offerings. + 2 Pastas, with 1.5L Coke. It comes with Frequency Card too that gives a customer a stamp for every Php500 worth of purchase. On the 3rd visit, you get a FREE spaghetti boat. On the 6th visit, you get a FREE Barkada size pizza of any flavor when you call for delivery. Wow, I love freebies! The card can be used for dine in or take out, points can be used for free food, plus you get a chance to win monthly. The card is only Php100 and valid for 3 years. My mom was just telling me that it seems that we would have more pizza deliveries at home starting today! Anyway, I hope you guys have a good day today. 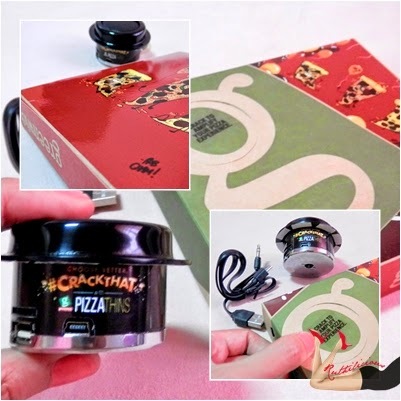 If you missed the free 100 boxes of #CrackThat pizza, just head on over to your nearest store. Try the 7-Cheese Pizza! (yes, 7!). Elmo said that it is his favorite. I am loving it too! I took this home, and despite the traffic, it was still good and cracking! Have you tried the Greenwich Thin Pizza?